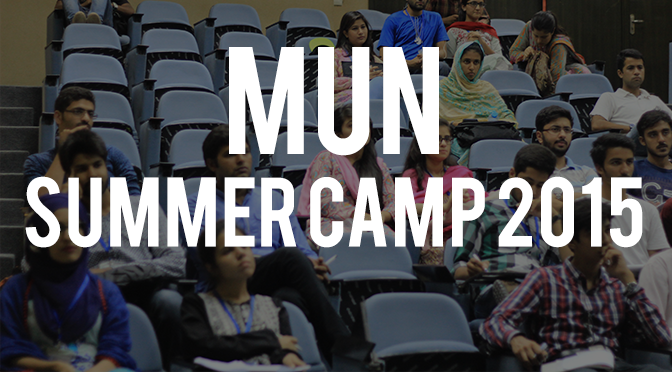 There was a large turnout of eager students at the inaugural session of the MUN summer camp on 4 June 2015, where the president of the MUN society, Areab Shuaib welcomed the many new faces by introducing himself, explaining the idea of MUN and relaying the agenda of the summer camp sessions to come. The session timings were told to be from 1 to 3 pm Tuesdays and Thursday to accommodate the majority of the students’ schedules during the summer semester. He went on to discuss the success of FORMUN ‘14 in comparison to other MUNs, he explained the concept of MUN to us by briefly explaining what MUN means and also by showing a few videos depicting the Dos and Don’ts of MUN. 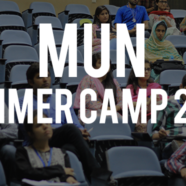 He touched upon the different events the MUN society participated in besides FORMUN; like frequent INTRAMUNs, summer camp training sessions, and other national and international MUNs. Towards the end of the session, Vice President Abdul Hanan took over the microphone, introduced himself and the rest of the MUN team to the audience and encouraged the members of the audience to introduce themselves individually. This exercise was meant both to break the ice among the students and to build on their confidence to speak in large audiences. The session ended with an activity in which a person had to decide on a partner and have a discussion with them.